I'll be honest, as first time parents with a babe whose favorite hobbies are eating and observing the world around him, our first several months of our little's life in the sleep department were beyond rough. One of the biggest game changers for us, however, was finally creating an effective routine for all of us and sticking to it each and every day. Now, I can honestly say something that during those long days and nights, I wasn't sure would ever come out of my mouth - our little man is a pretty darn good sleeper! Not only that, (and I don't want to jinx it) but our morning and bedtime routines run pretty much like clockwork around here these days. Like I said, there are no bells and whistle's here folks. That's because, to be honest, the key to our success hasn't had much to do with the "what" portion of our routines, but really in the "how" we carry them out. When it comes to the "how" - we have two key words we live by - short and predictable. Routines, specifically those that take place before bed, should not be long, drawn out endeavors. They should be short and sweet, and each piece should serve a purpose. Our morning routine, including breakfast on the table, takes less than 30 minutes and our bedtime routine is around 15 minutes total. Now let's chat a bit about predictability. As a teacher myself, I know what an impact having predictable routines can have on a classroom full of students and honestly, it couldn't be more true of my journey as a mother. While I am certainly all for adventure and spontaneity, here and there, throughout our days, I have found that the beginning and the end of the day just aren't the right spaces for that for our little guy. He needs a predictable pattern he can rely on. Frankly, we all do. Because of this, we are fairly firm on bedtime at our house. We start our above routine around 6:15pm each evening, and Asher is in bed by 6:30pm. While morning wakeup time varies a bit each day, Asher usually wakes up between 6:00-6:30am, upon which we then complete the above morning routine. Does it require a bit of sacrificing on our part at times to ensure our child is in bed at this time each night? And does our child ever have to miss out on events so that he can hit the hay? Yes, sometimes. But for us, setting up healthy sleep patterns for him have been well worth the effort. Not only are we predictable with the timeline of our routines, but the order as well. We do our best each day to follow the steps the same way so that Asher knows what to expect. For instance, we always sing our toothbrushing song as we brush our teeth (see more of this here). We always read one book before bed. And, praying is always the last thing we do together before we place Asher in his crib for the night. Within this structure, we also offer Asher choices at specific points along the way. This enables him to have a sense of empowerment and connectedness to our routines as well. For instance, he always gets to choose the book he reads before bed. He can choose whether he wants to sit on mama or dada's lap for prayer or whether he prefers to sit on the floor himself. And he also has the choice each morning of whether he'd like to play or "help" us prepare breakfast in the kitchen. While the steps of the routines were determined by us as his parents, I have found that providing Asher with some of this flexibility to make choices within them is equally as important to their success. Something we have just recently introduced to Asher as he is becoming more and more independent are mini visual schedules representing his morning and bedtime routines. Our goal with these is to enable him to begin to lead himself through the steps of his routine so that eventually it becomes something that is directed by him, and it's not always dear old mom and dad guiding him through each step. As he is almost 20 months old, he is beginning to demonstrate to us his desire to do more on his own - and this is one of the ways we are hoping to support him in doing just that, while at the same time hopefully setting up effective lifelong habits from the get go. Honestly that's the just of it friends. There's not a lot to it, because when you boil it down, there really isn't a lot to it. But I cannot tell you the world of difference these seemingly simple routines have made in all of our lives here at the Happ abode. A few things I would like to add before I close are this - first, it took a lot of practice for us to get to this point, and there are still things we continue to improve upon within these routines each day. It took months, for instance, of us modeling for Asher how sit, fold your hands together in prayer and speak with God each day before he finally started catching on to some of the pieces himself. Let's be honest for many weeks he just ran around the room in true toddler fashion as one parent prayed and the other kept one eye open scoping the scene. But with perseverance and practice, little by little, each step is improving with each passing day. 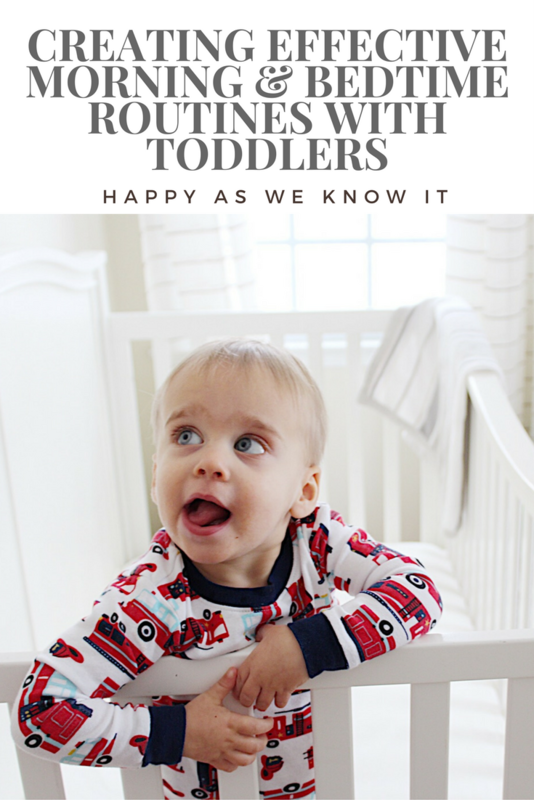 Secondly, I think we all know that as parents of toddlers things change on a daily basis. They are trying to figure out this world around them, and constantly keeping us on our toes trying to keep up with all the wonderful spirit they bring to the table. So while I am sitting here and "preaching" the importance of "same, same same", I know that at some point I may need to be more flexible, and at some point portions of the routine may even need to change to meet my ever changing child's needs. As he grows it is only natural that I give Asher the reigns a bit more over these routines and let him begin to shape them more on his own. After all, as I shared at the very beginning, it's not really the "what" that is the most important, but the "how" - and my hope is that he will learn how to create routines that work for him on his own so that he can do it even after he leaves home someday (*sigh*) as well.